Metso has won a significant order to deliver a large-scale iron ore pellet plant and related engineering services to Tata Steel for the expansion of the Kalinganagar operation located in Odisha state in India. The order has been booked in Metso's 4th quarter 2018 orders received. The new pellet plant will be equipped with capability to utilize a dual fuel burner and a burner management system that will enable the use of iron ore feed from different sources, optimizing the overall cost of production, including the fuel type and consumption. "Metso and Tata Steel have a history of more than 25 years of successful cooperation. We take this much-valued partnership and the confidence in our know-how as clear indicators that we have been able to meet their business needs in a fast-changing business environment. In line with our value proposition, we will assist Tata Steel in minimizing fuel consumption and reducing their carbon footprint in pellet production," says Victor Tapia, President, Metso's Mining Equipment business area. Tata Steel Limited is amongst the largest steel-producing companies globally, with manufacturing operations in 26 countries and crude deliveries of about 28 million tons in 2017. Operational since 2015, the Kalinganagar plant is one of Tata Steel's key manufacturing locations in India. "Working together with Tata Steel over the years, we have developed a strong understanding of their business and of what adds value to their operation; this understanding helps us to deliver the required performance. On that account, we were able to design a pelletizing solution that enables the lowest cost per ton of pellet produced while providing flexibility for varying qualities of feed to optimize the production quality and rate," says Kamal Pahuja, SVP Indian market area at Metso. Today, Metso is the leading player in pelletizing in India. This order is Metso's first iron ore pellet plant solution for Tata Steel. In summer 2018, Metso reported its largest-ever pellet plant delivery to JSW Steel. Metso Expertune PlantTriage(TM), a control loop monitoring system, oversees process control loops night and day, diagnoses and prioritizes opportunities for improvements, and pinpoints major economic paybacks. As a tool of the digital world, PlantTriage leverages Metso's decades of expertise in automation and control valves. It gathers process data from many different control systems, and monitors of thousands of control loops. Metso's profound understanding of smart positioners and valve position feedback systems has been incorporated into PlantTriage to meet customers' needs for improved reliability. PlantTriage has also been tested intensively in different demanding industries, including refining, chemicals, and pulp and paper. "PlantTriage delivers value to our customers by identifying and getting to the root causes of control system performance issues. We have started to see that valve position feedback information is becoming more available in control systems that can communicate with smart field devices. This data permits more accurate diagnostics of valve performance issues. We have introduced several new assessments and a problem solver report related to valve positioner performance," explains Steve Obermann, Senior Product Manager, Metso. For increased security, PlantTriage Version 13 contains several cybersecurity enhancements. JAVA-related vulnerabilities have been eliminated. Integration with Microsoft Windows Authentication allows administrators to manage network security seamlessly, according to the customer's in-house IT policies. In addition, PlantTriage Enterprise Systems have been upgraded. An Enterprise System provides a single view of the corporation; combining KPIs and results from individual plant sites to a central portal. In Version 13, PlantTriage Enterprise Systems provide alerts for conditions on loops and units in remote PlantTriage systems. Metso has opened a new service center in eastern Germany, in the Leuna industrial area. The new service center supports the company's strategy to grow its valve and field device service business globally and strengthens Metso's service capabilities within the German region for major petrochemical, energy, oil & gas and pulp & paper companies. Metso is continuosly investing in its service and production capabilities globally in order to deliver customers secured plant availability while optimizing total maintenance costs. Metso has over 55 automation service hubs, 36 valve and field device Service Centers and over 1,000 service professionals serving automation customers around the world. "Metso's services portfolio focuses on three main areas: solving technical and process issues, improving business performance, and managing a business area. Our maintenance services range from the servicing of individual Metso valves all the way to maintenance and device management solutions for complete plants. We use intelligent solutions to service valves and other field devices from Metso or other manufacturers,'' explains Mikko Keto, President, Services, Automation, Metso. "The new service center in Germany is in line with our strategy to continuously strengthen our global network of Service Centers and service experts so that we are close to our customers to best support their business needs,'' he continues. Metso's services business is backed by Metso's market-leading valve solutions, which include control valves, automated on/off and emergency shutdown valves, as well as intelligent valve controllers and condition monitoring. 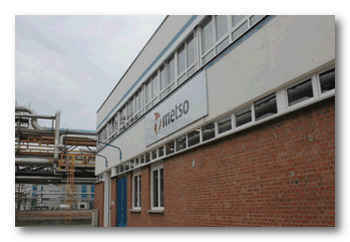 Metso's world-leading brands include Neles®, Jamesbury® and Mapag®. The company is currently building a new Neles globe valve technology center in South Korea. Metso's other valve technology and supply centers are located in Finland, USA, China, Germany and Brazil. Sierra Gorda Sociedad Contractual Minera (SCM) has chosen Metso to supply state-of-the-art control and on/off valves to the Sierra Gorda copper/molybdenum mining project which is currently under construction in the Atacama Desert in Antofagasta region, North of Chile. The valves will be used to control the flow of process and make-up water for a variety of applications in the mine. The Atacama Desert is one of the driest regions on earth. Precipitation is extremely rare and there is no surface water at the project area. Therefore, the project will rely heavily on sea water delivered via a 350 kilometer long pipeline from the Pacific Ocean. To combat the highly corrosive effects of seawater, Metso will provide valves constructed of SMO254tm austenitic stainless steel, which is highly resistant to the effects of chlorides. Metso will deliver 54 Neles® V-port segment control valves from 1" to 12", on/off valves from 3" to 18" (with Series B1, QPX pneumatic actuators or BIFFI electric actuators) as well as numerous Jamesbury® ball valves. All of the valves are rated to ANSI#150. The Sierra Gorda mining facility is expected to process 110,000 tons per day (t/d) of mineral and its operations will begin late in 2014. The anticipated life of the project is 21 years and the equipment supplied has a 25-year life expectancy. Metso is the leading valve solutions and services provider. Its solutions include control valves, automated on/off and emergency shut-down valves, as well as smart positioners and condition monitoring. Metso's world-leading brands include Neles, Jamesbury and Mapag®.